This is going to be my first 2019 post and in this post, I am excited to share couple of ways to configure Hybrid Linked Mode (HLM) using REST API. One of the ways is using UI REST client i.e. apiexplorer and another way is using python. If you are not already familiar with vCenter server REST APIs, I would suggest to first go over my earlier post i.e. Getting started with vCenter REST APIs. Before I move further, I would like to point out that I am not explaining end to end steps required to configure HLM since Emad already has a detailed post on it here. My focus is on vCenter REST API required to link your Onprem vCenter server to VMware cloud on AWS (Cloud vCenter). 1. As you might know, there are 2 ways from which user can configure HLM. 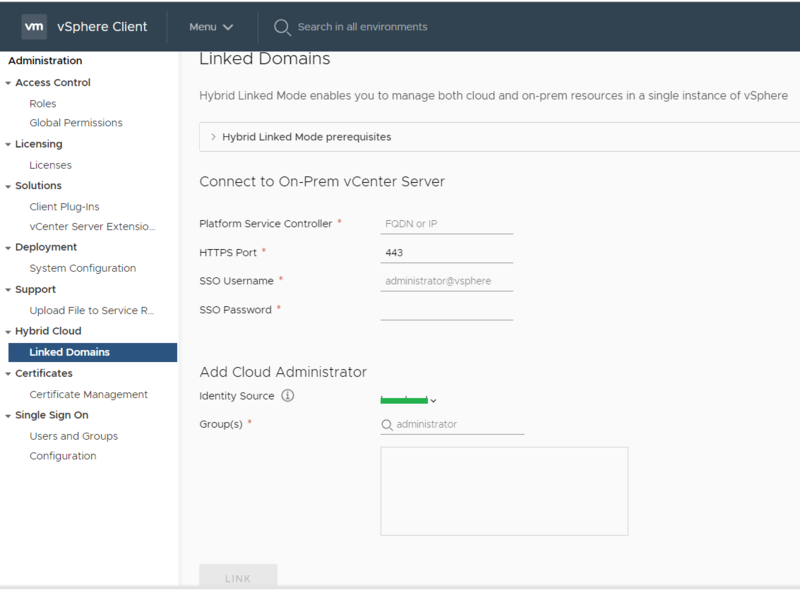 One way is to configure HLM from Cloud vCenter,where you can see both VCs (onprem and cloud VC) from cloud vCenter vSphere client (H5C) and another way is to configure HLM using vCenter cloud gateway,which allows users to see both VCs from vCenter cloud gateway H5C. 3. Great news is that API remains exactly same no matter which way you go for. Only change is: If you are configuring HLM from cloud vCenter (i.e. VMC VC), API end-point would be VMC VC IP/FQDN and if you are configuring HLM using vCenter cloud gateway, API end-point would be vCenter cloud gateway. You could see, in order to link, we need to pass PSC details and cloud administrator group(s). This is exactly we will do using REST API. Below are the REST APIs available around HLM. We are more interested in POST /hvc/links call as this is the key API for configuring HLM no matter its from VMC VC or vCenter cloud gateway. By now you might have already used apiexplorer (swagger based) vCenter REST client. To access it, just browse “https://[vCenter IP]/apiexplorer”. If you see above screen-shot, there are multiple APIs on HLM operations. 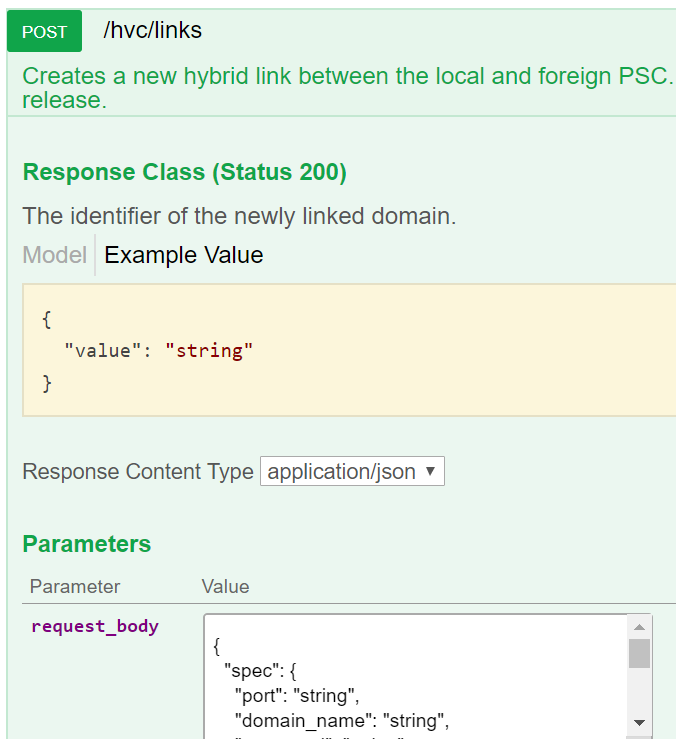 The one we are interested in is “/hvc/links” POST method, which is responsible for HLM linking. As part of above request body, we need to pass exactly the same details as we passed while configuring from UI. Let us take a look the “request_body” spec I passed. Let us go over each parameter passed. ssl_thumbprint : This is again Onprem PSC SSL thumbprint, you can get it using one of the ways posted here . I am going to write a post on how to get vCenter/PSC thumbprint using API itself, please stay tuned. admin_groups: here you specify cloud administrator group(s). Before configuring HLM linking (apart from HLM standard requirements that Emad has posted here) , identity source must be configured on both Onprem and VMC first and cloud admin groups must be given global permissions on both VCs. By this time, I am sure you know everything about the API, now lets head on to python way of doing these things.
""" Get arguments from CLI """
Below is how you would run the script, take a look at the what parameters need to be passed. Each parameter is explained in above script as well. I hope you enjoyed reading this post. Stay tuned for my future VMware cloud on AWS posts.